Cinco de Mayo is just around the corner. 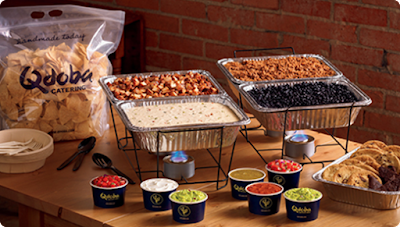 And wouldn't you be the coolest person in the office if you provided Qdoba Catering to celebrate? Well, Chicago Foodie Sisters, along with our friends at Qdoba, would like to help you do just that! 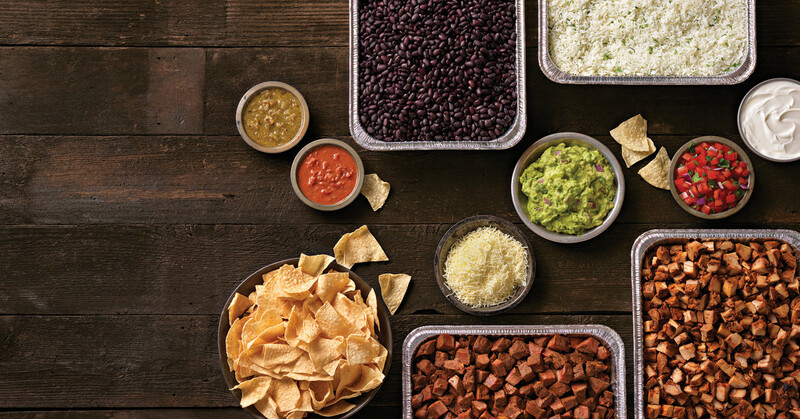 Putting together a last-minute party is easy with Qdoba Catering! Cinco de Mayo is a time to celebrate, and Qdoba knows how to kick off the celebration in style. The fast casual Mexican restaurant brand will do all of the heavy lifting so you won’t have to worry about a thing. With a full burrito bar, their famous 3-cheese queso and flavor-packed guac (at no extra charge! ), guests will leave happy. So put on that sombrero, fire up the mariachi band and enter to win a $100 Qdoba catering gift card to use on some great Mexican fare for your fiesta! Do two of the following. -Leave a comment on this blog post letting us know what your favorite Mexican dish is. -Follow Chicago Foodie Sisters on Facebook. -Follow Chicago Foodie Sisters on Instagram. "Go to ChicagoFoodieSisters.com for chance to win $100 catering gift card from #Qdoba. #CincodeMayo #ChicagoFoodieSisters" Ends May 1. -Share this blog post on your Facebook page. Also, send a direct message on the Chicago Foodie Sisters Facebook page with your email address and phone number so we can notify you should you be the winner. Email addresses and phone numbers will not be shared with any other party. Contest ends May 1 at 7 a.m. Winner will be notified and have 12 hours to respond at which time another winner will be selected if you have not responded. And just for fun, here's a little Cinco de Mayo quiz! 1. Q: What day is Cinco de Mayo celebrated? 2. Q: What are the true origins of Cinco De Mayo? 3. Q: Approximately how many avocados are consumed on Cinco De Mayo? 4. Q: TRUE or FALSE: The Margarita has always been a part of the Cinco De Mayo tradition, dating all the way back to the origin of the holiday. 5. Q: Approximately how many tortilla manufactures are there in the United States – 360, 501, or 720? 6. Q: TRUE or FALSE: More people drink on Cinco De Mayo than they do on St. Patrick’s Day. 7. Q: Is Cinco De Mayo more widely celebrated in the United States or Mexico? 8. Q: Does Cinco De Mayo celebrate Mexico’s Independence Day? 9. Q: The traditional triangle shape tortilla chip was created in 1920, 1930, or 1940? Answers: 1) May 5. 2) The holiday celebrates the Mexican victory over the French at the Battle of Puebla on May 5, 1862. The victory was unexpected, as the Mexican army won the battle despite being smaller and ill-equipped. 3) According to a report by the California Avocado Commission, up to 81 million avocados are consumed on Cinco de Mayo, thanks to the rise in demand for guacamole. 4) FALSE. Although the Margarita is thought to be the traditional Cinco de Mayo libation, it was invented many years after annual Cinco de Mayo celebrations began. 5) 360. 6) TRUE. In fact, more alcohol is consumed on Cinco De Mayo than the Super Bowl (No. 10) and St. Patrick’s Day (No. 11) 7) United States 8) No. Cinco De Mayo is often confused with Mexican Independence Day. It actually celebrates Mexico’s unexpected victory against the French in 1862. 9) 1940. ***The $100 gift card has been provided by Qdoba. I was not compensated for this post. All opinions are my own. I love Qdoba's shredded beef burritos with queso. Walker is a fan of the chicken tacos, beans and rice. We eat there pretty often.